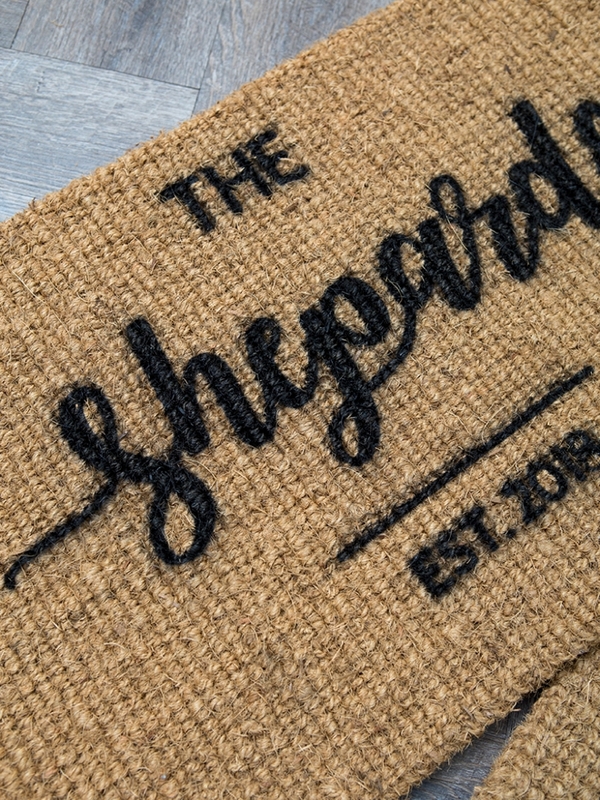 OMG, These Handmade, Personalized Natural Door Mats Are SO Cute! Today’s project is perfect for spring! 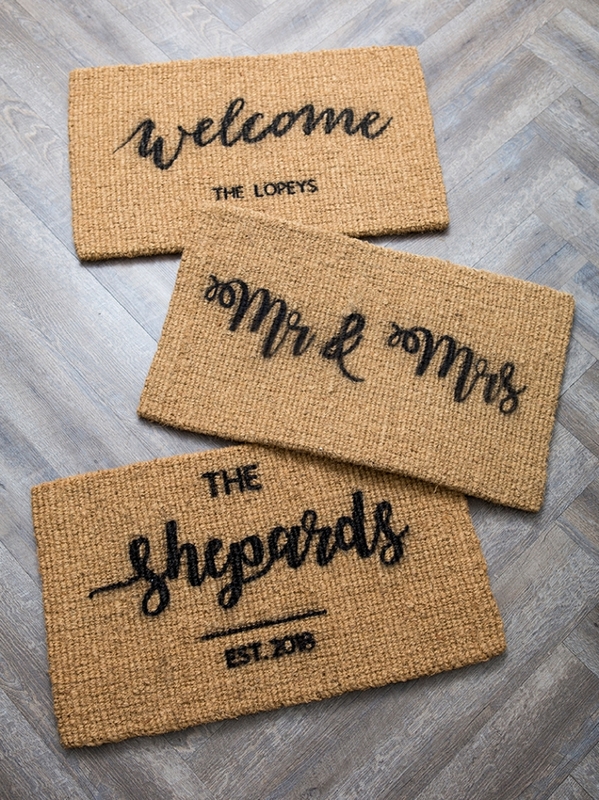 Everyone’s door could use a little refresh right about now… especially if you’re a newlywed or about to be! 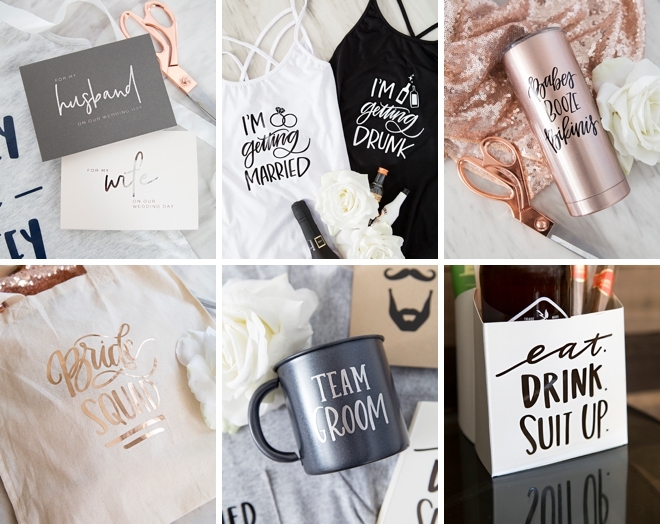 In this post, I’m sharing a deep dive into my process of using Cricut’s Design Space to create custom projects. If you’re ready to take your Design Space skills to the next level, you’ll want to fill up your coffee and take a few minutes to watch my little screen video below. The longest part of this project will be designing your doormat stencil and properly taping it off, the spray painting takes like 1 minute. All in all, this project can easily be completed in 2 hours or less. 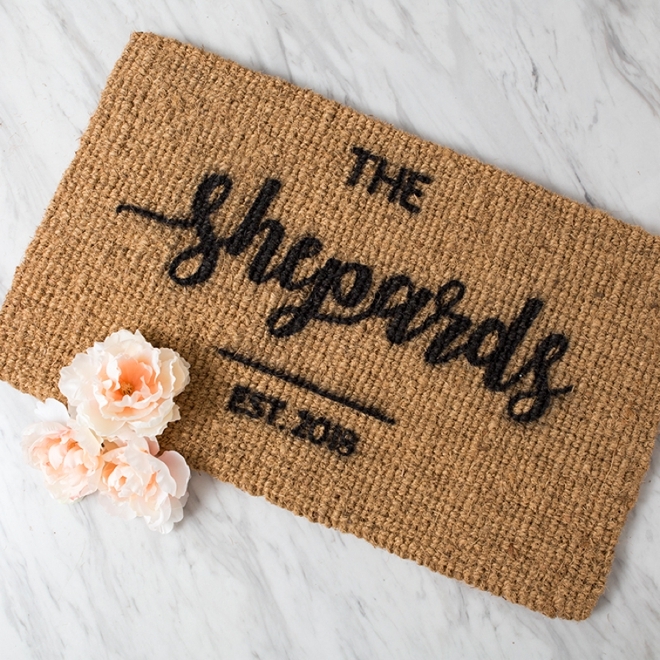 It would be the perfect gift for a friend who just said I DO, or the perfect project to chase away your post-wedding blues! Looking to create designs similar to mine? Follow the links below to each Design Space canvas to copy our designs for yourself. You won’t be able to edit them, but the sizing and fonts are there for you to see! 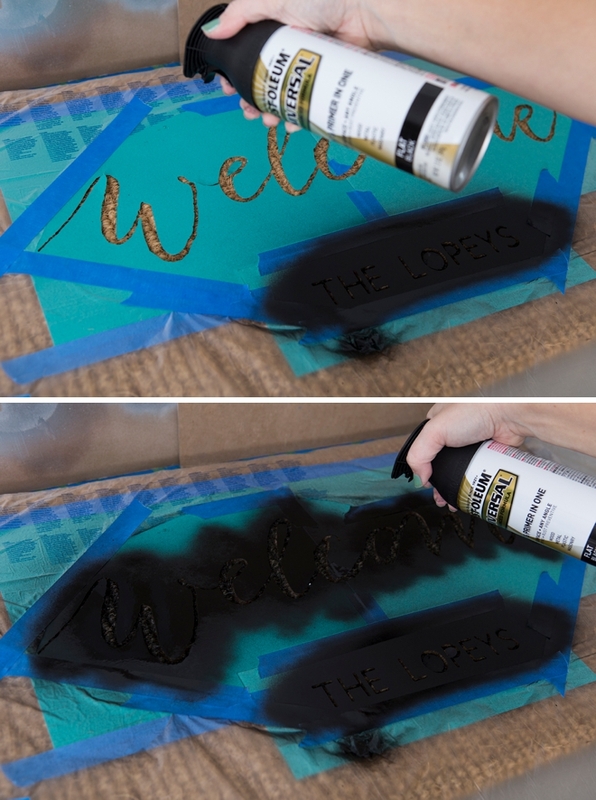 Follow the prompts in Design Space to cut all the elements of your doormat stencil. I used 3 separate cutting mats to keep myself organized, so that I didn’t have to remove the spare letter bits (like the inside of the s’s, o’s, a’s, etc) until I needed them. 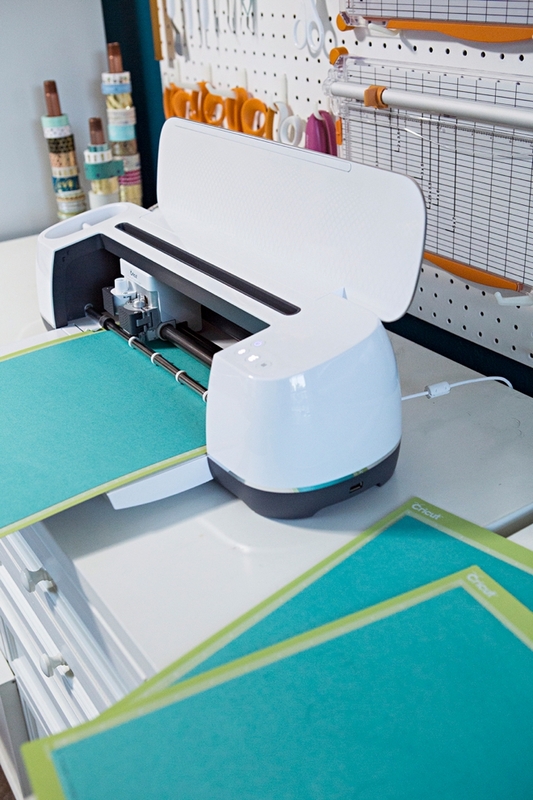 Since we created a stencil larger than the Cricut cutting mat, we have to re-assemble it with tape… cut areas that you need and measure with a ruler to make sure all is aligned properly. Set the mats with the spare letter bits off to the side. 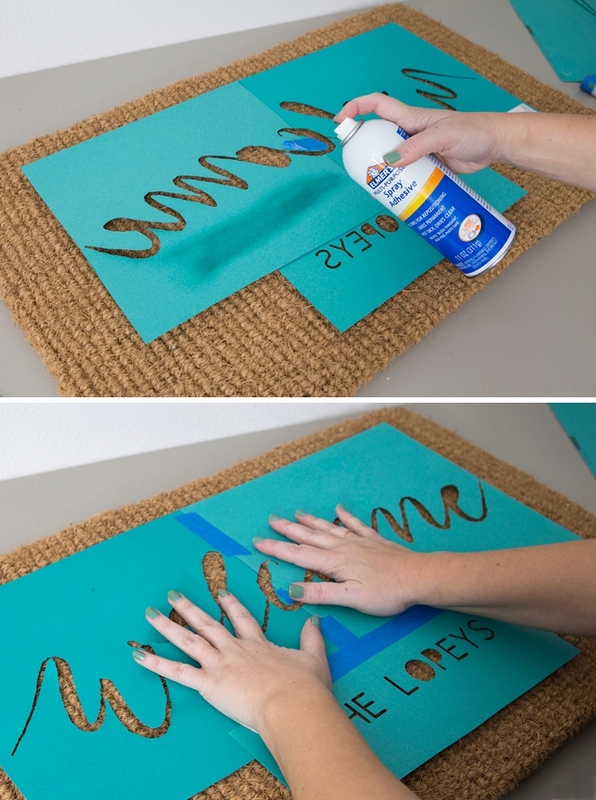 Flip your giant stencil over and cover with spray glue. It’s best to do the spraying part outside because of the glue fumes. 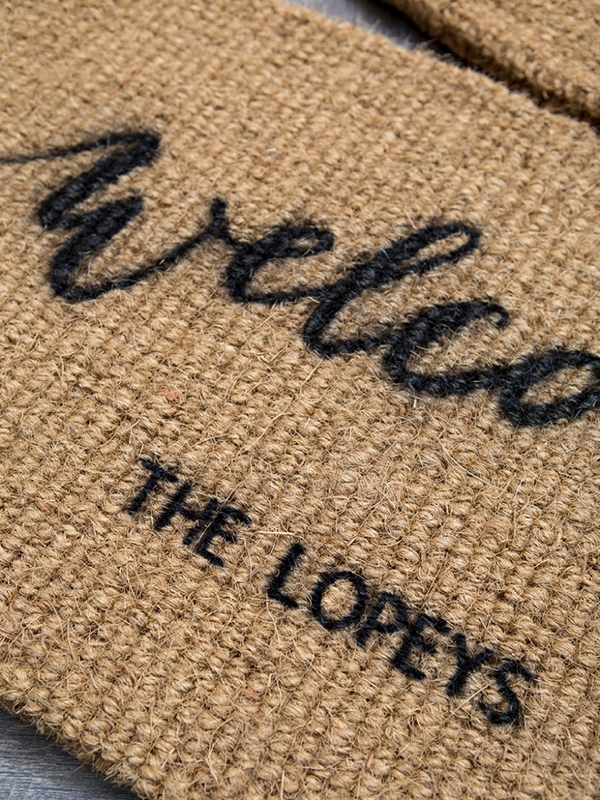 Then press firmly to adhere to the doormat. Because of the doormat texture, it won’t perfectly adhere but it will be enough. 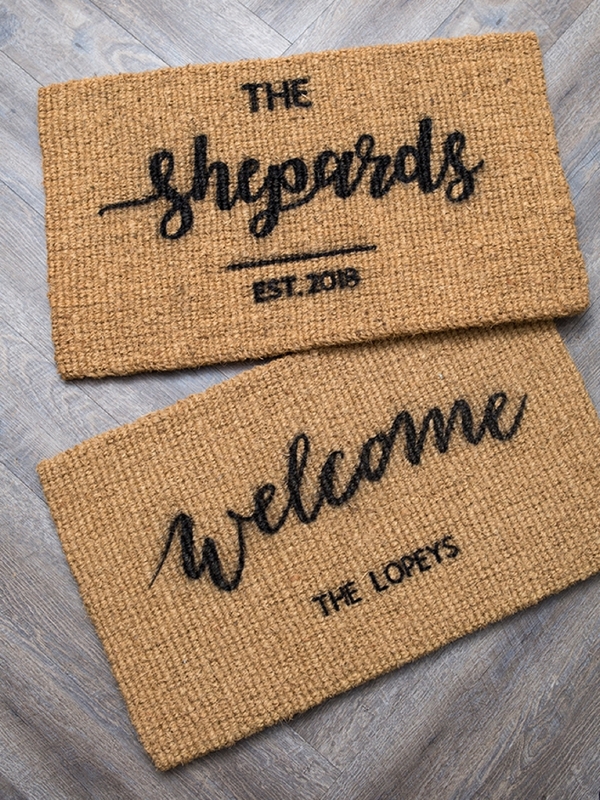 Crafters Tip: once you do this, you don’t want to move the doormat or the stencil will lift up, so do it where you plan to spray paint! Beauty Tip: you gals know that my manicure is always on point. However, this spray glue will ruin your manicure in 1 spray, so get your nails done after you’ve completed this project. My appolgies for the hideous mani, lol! 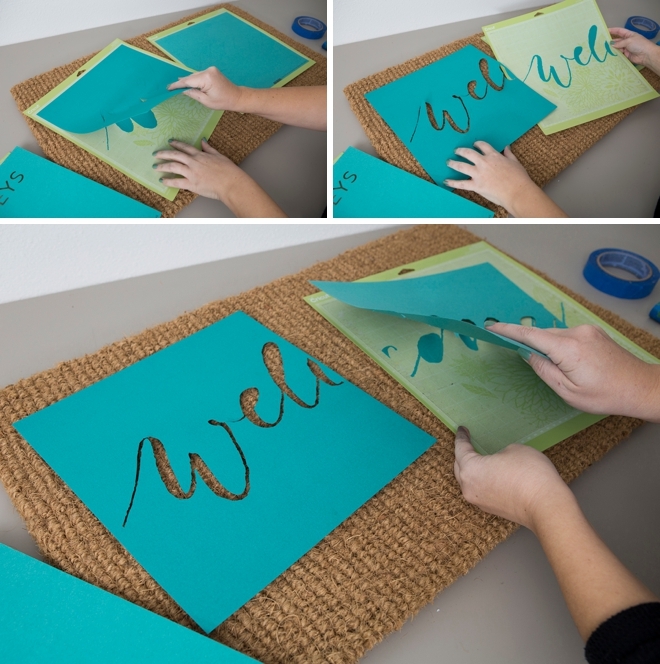 Go back to your cutting mats and carefully remove the spare letter bits and glue them to the mat to complete your stencil. 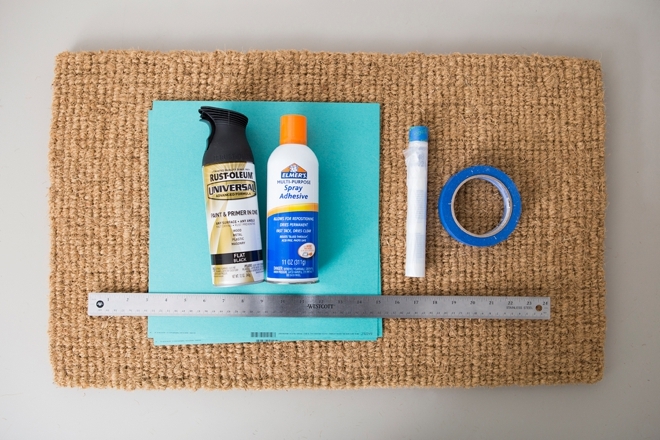 Using painters tape and painters plastic, or whatever you have that works, carefully tape off all the areas of the doormat that you don’t want spray painted. I’m using this awesome pre-taped painters plastic that I bought for painting my house, and it’s fabulous for masking off spray painting projects! 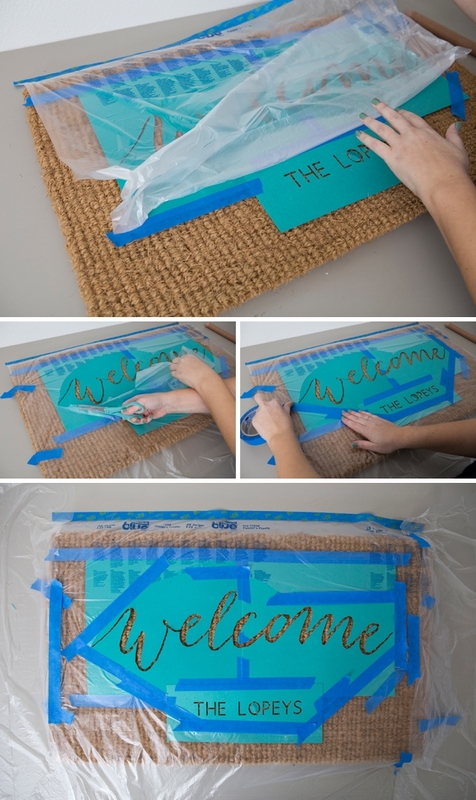 As soon as you are done painting, remove your stencil and masking plastic to reveal your gorgeous new doormat! Let dry for about an hour before placing at your door! Just a friendly grammar reminder: your last name does not require an apostrophe on personalized items like this! When you’d like to pluralize a family name (a proper noun), in most cases we just add an “s” to the end. For example: The Kidders, The Shoemakers, and The Smiths. However, when a family name ends in s, x, ch, sh, or z; we form the plural by adding an “es” to the end. For example: The Joneses, The Churches, and The Therouxes. 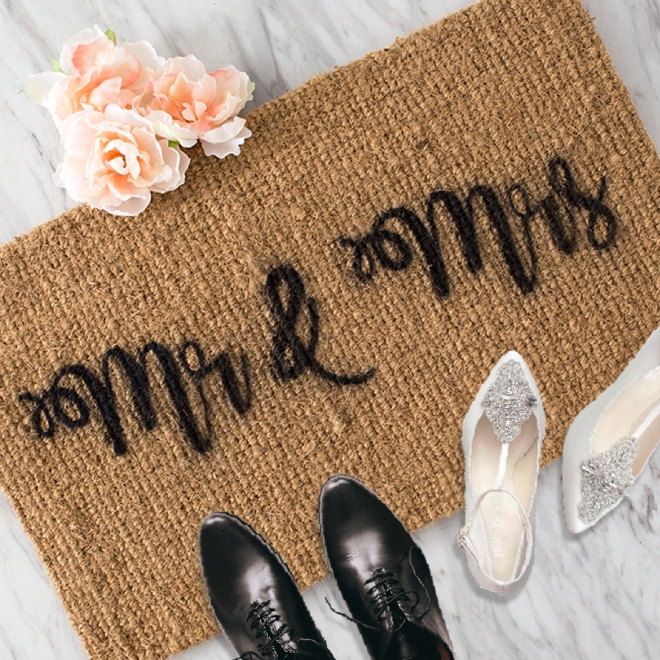 You definitely don’t have to be a newlywed to make one of these super cute doormats for your home. 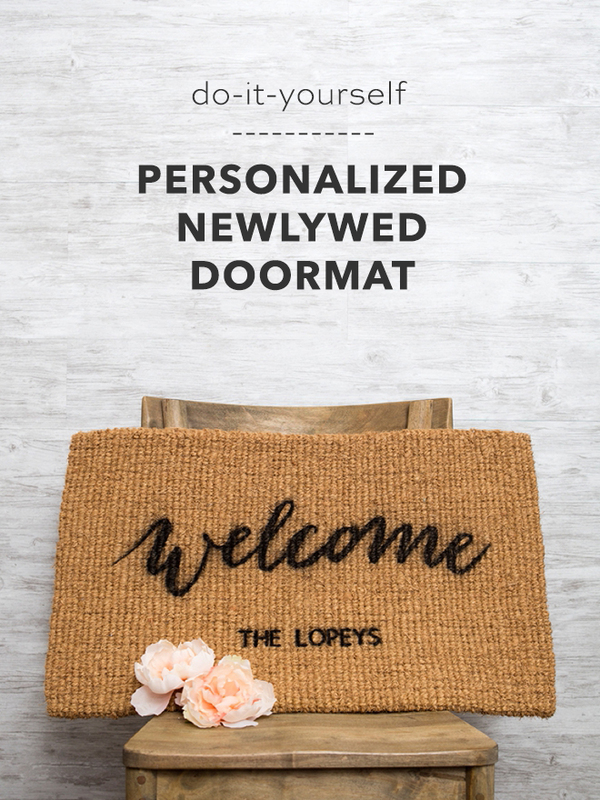 Whether you got married yesterday or 40 years ago, your doorstep will love to be adorned with a personalized touch like this. Keep it classy or get cheeky, you now know how to make them – the design is fully up to you!